Cross-Cultural Management Textbook is a practical course-book that synthesizes in a practical way contemporary cross-cultural communication and management knowledge for students and professionals. It is the team work from twelve well-respected world authorities who represent a variety of countries and cultures. Designed to prepare students from diverse backgrounds to comprehend the influence of culture in management and communication, it helps them develop the behaviors and skills necessary to rapidly adapt to a world where cultures mix as never before. Each contributor is a published author on topics constituting the field of cross-cultural management today. With the active support of several European universities, this comprehensive textbook includes case studies, up-to-date theories illustrated by real life examples, and workshops, all coordinated into an easy-to-use manual. All the case studies and workshop are accessible on this website. The contributions of the international practitioners and professors in this field provide expert knowledge. This extensive authoritative textbook is the missing link between various writings of renowned academics and specialists and the pragmatic approach of real world of practitioners who are confronted daily with intercultural situations. Thanks to content from numerous nations and cultures, the book encourages the reader to think outside of the box, and expand his or her considerations beyond their present boundaries. 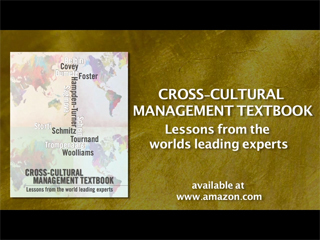 Cross-Cultural Management Textbook is primarily intended for students and instructors, in particular, instructors looking for an outline for their management courses. Professionals, consultants, managers, and trainers whose daily work involves international and cross-cultural challenges will benefit from this text as well. Together, the team of authors takes readers into a world of complementary ideas and beliefs that resembles life in the real world. Synthesizing today’s best concepts, this book aims to be the authoritative textbook on the instruction of cross-cultural management in all senses. Craig Storti contributed his famous cross-cultural dialogues to illustrate the text of his fellow co-authors.